In the first part on this series about the MVC (Model-View-Controller) design pattern, I discuss the individual parts and what they represent. In the second part, I layout some common conventions of MVC frameworks. Both of those posts lead up to this one, in which I want to talk about actual code. In my opinion, it’s not too hard to understand what MVC means, in theory, or to follow a framework’s naming rules, but then you start developing a project and can quickly become confused as to where you actually put your code. And that’s what’s required in a rather basic page. Even if you use included files for the database connection and the HTML template, there’s still a lot going on. And if you link those department pages to another page that shows more information about the department, passing along the department ID in the URL, that other page will need to add some data validation steps. And if you have a page that both displays and handles a form, like for adding an employee, there’s way, way more code and logic to add. Not that there’s anything wrong with this, mind you—I still program this way as warranted—but it’s the antithesis of what MVC programming is about. 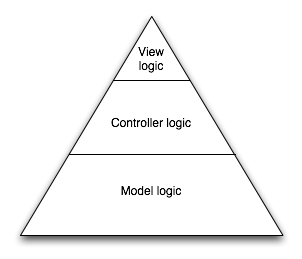 You can think of MVC programming like a pyramid, with the Model at the bottom, the Controller in the middle, and the View at the top. The code should be distributed appropriately, with most of it in the Model, some in the Controller, and very little in the View. From a programming standpoint, a View should do very little, mostly just echo out the values of variables. The most logic a View should have is using a conditional to confirm that a variable has a value before attempting to print it or creating a loop to print out all the values in an array. The View generates what the user sees, that’s it. The Controller has more logic and code to it, as it responds to user actions, and acts as an interface between Models and Views. But it’s a common mistake to put code in a Controller that should really go in a Model. A guiding principle of MVC design is “fat model, thin (or skinny) controller”. This means you should keep pushing your code down to the foundation of the application (aka, the pyramid’s base, the Model). In a post I saw about the MVC architecture, they describe the Model as “maintaining state” between HTTP requests. I think that’s a good way of describing it because it encompasses both stored data and processed data that doesn’t necessarily get stored. So a departments Model represents stored data that is added, updated, and retrieved in multiple requests, while a contact Model represents data entered by a user in a form, validated, and sent in an email. Now the code in the Controller is largely about…um…controlling the action, i.e., delegating responsibilities and reactions, responding to user input, etc. Controllers are classes, filled with methods that do the actual work. The work is largely retrieving specific Models (e.g., one record from a table or every record), calling upon a Model to be inserted, updated, or deleted, and calling upon a View to be rendered. The Model does everything else, like running the actual queries, validating the data, and so forth. However, in a framework, most of that code is built into the framework itself, so you can call a save or delete method on a Model, but the Model itself doesn’t have any such method defined (the Model inherits those methods from a framework class on which it’s derived). The $departments variable gets passed along to the View so it can print them all out. This is basic MVC using Yii where, again, the departments Model doesn’t actually define a findAll() method, it just inherits one. There you’re saying that you want to find the employee Model whose primary key value is the same as the departmentHeadId value in a given department Model. What you absolutely don’t want to do is run that code or any similar query in the View. Very bad! Now, you might be inclined to put that code in the Controller, but in order to do that, you’d need to loop through each retrieved department, fetch the departmentHeadId, find the employee with that primary key value, and then associate the retrieved info with the department. Or you could retrieve all the employees and have the View find the corresponding employee record. In either case, it’s way too much code and logic to be outside of the Model. As another example, say you want to display employees names in the format LastName, FirstName, or something more elaborate. If you write a method that does that, defined in the employees Model, you can call that method anywhere that uses an employees Model and that might require showing the person’s name. This would include the page that lists all employees, the page that shows the information for just one employee, and the page that shows the head of a department. For example, in the above getDepartmentHead() method, you could return $emp->getFormattedName(). Whew! So, per my usual habits, this post has become far longer than I expected. I hope that I achieved my goal of explaining MVC using real-world examples, in a way that illuminates and clarifies this approach. If I haven’t, let me know and I’ll expand upon this in a subsequent post. As a postscript, a few hours after originally posting this, I touched up the last few paragraphs, adding more code to better illustrate the point (perhaps).